Glucagon-like peptide-1 (GLP-1) and its agonists are under assessment in treatment of type 2 diabetes, by virtue of their antidiabetic actions, which include stimulation of insulin secretion, inhibition of glucagon release, and delay of gastric emptying. We examined the potential of GLP-1 to improve glycemic control in type 1 diabetes with no endogenous insulin secretion. Dose-finding studies were carried out to establish mid range doses for delay of gastric emptying indicated by postponement of pancreatic polypeptide responses after meals. The selected dose of 0.63 micrograms/kg GLP-1 was administered before breakfast and lunch in 8-hour studies in hospital to establish the efficacy and safety of GLP-1. In outside-hospital studies, GLP-1 or vehicle was self-administered double-blind before meals with usual insulin for five consecutive days by five males and three females with well-controlled C-peptide-negative type 1 diabetes. Capillary blood glucose values were self-monitored before meals, at 30 and 60 min after breakfast and supper, and at bedtime. Breakfast tests with GLP-1 were conducted on the day before and on the day after 5-day studies. Paired t-tests and ANOVA were used for statistical analysis. In 8-hour studies time-averaged incremental (delta) areas under the curves(AUC) for plasma glucose through 8 hours were decreased by GLP-1 compared to vehicle (3.2 ± 0.9, mean ± se, vs 5.4 ± 0.8 mmol/l, p < .05), and for pancreatic polypeptide, an indicator of gastric emptying, through 30 min after meals (4.0 ± 3.1 vs 37 ± 9.6 pmol/l, p < .05) with no adverse effects. Incremental glucagon levels through 60 min after meals were depressed by GLP-1 compared to vehicle (-3.7 ± 2.5 vs 3.1 ± 1.9 ng/l, p < .04). In 5-day studies, AUC for capillary blood glucose levels were lower with GLP-1 than with vehicle (-0.64 ± 0.33 vs 0.34 ± 0.26 mmol/l, p < .05). No assisted episode of hypoglycaemia or change in insulin dosage occurred. Breakfast tests on the days immediately before and after 5-day trials showed no change in the effects of GLP-1. We have demonstrated that subcutaneous GLP-1 can improve glucose control in type 1 diabetes without adverse effects when self-administered before meals with usual insulin during established intensive insulin treatment programs. The pharmacological actions of truncated glucagon-like peptide-1 (GLP-1), including stimulation of insulin release, suppression of glucagon release, and inhibition of gastric emptying, have provided the rationale for its assessment as a therapeutic agent for diabetes, with attention largely directed to type 2 diabetes . Acute studies with subcutaneous injections of GLP-1 in non-insulin-treated type 2 diabetes showed that the peptide can reduce glucose excursions after meals, and longer-term studies showed that administration of subcutaneous injections of GLP-1 before meals through periods up to several weeks can reduce the mean blood glucose levels in patients with type 2 diabetes in suboptimal blood glucose control, without clinical adverse effects [2, 3]. In type 1 diabetes, reduction of the blood glucose level following a meal was demonstrated with continuous intravenous infusion of GLP-1 through a period of three hours after starting breakfast, with concurrent administration of insulin by closed-loop programmed infusion . The reduction of the glucose excursion with concurrent reduction of insulin delivery in this study was taken as evidence of enhancement of insulin sensitivity, but interpretation did not take account of inhibition of gastric emptying. In a further study of type 1 diabetes, virtually complete suppression of glycemic excursions was produced with intravenous infusion of GLP-1 during and after breakfast in volunteers who did not take their premeal insulin injection; this effect was attributed largely to inhibition of gastric emptying . Reduction of fasting hyperglycaemia in type 1 diabetes by intravenous infusion of GLP-1 was attributed mainly to reduced glucagon levels . We also studied the effects of subcutaneous injection of GLP-1 in volunteers with type 1 diabetes, some of whom had residual insulin secretion . After ingestion of a standard liquid test meal preceded by subcutaneous injection of GLP-1 and the usual insulin dose, glycemic excursions were reduced in volunteers with negligible residual insulin secretion as well as in those with measurable responses of plasma C-peptide to the meal. In the present study we examined the potential of GLP-1 to improve control of plasma glucose in type 1 diabetes during intensive insulin therapy in subjects who had no detectable residual endogenous insulin secretion. Dose-finding studies were employed to select a dose of GLP-1 that apparently delayed gastric emptying through approximately 30 min after beginning a meal. This dose was used before breakfast and lunch in 8-hour studies with self-selected diet-conforming meals to determine the safety and efficacy of GLP-1 under these conditions. The therapeutic potential of GLP-1 was further investigated in 5-day studies in which subcutaneous GLP-1 was self-administered before meals under conditions of normal activity outside hospital. All volunteers had type 1 diabetes with no detectable endogenous insulin response (meal-stimulated C-peptide < 0.10 nmol/l) and continued established programs of intensive insulin therapy using multiple daily injections of insulin or continuous subcutaneous insulin infusions, Table 1. In dose-finding studies subcutaneous abdominal injections of vehicle, 0.32, 0.63, or 1.25 μg/kg GLP-1 were administered with usual insulin before breakfast meals starting between 7:30 and 8:00 AM on different occasions at least 7 days apart after overnight fast. For 8-hour studies after overnight fast, volunteers received their usual dose of insulin, and either 0.63 μg/kg GLP-1, or vehicle, by subcutaneous injection in the abdomen immediately before breakfast starting between 7:30 and 8:00 AM, and again before lunch four hours later. Meals were self-selected according to individually prescribed diets, and were identical for each pair of studies. In all studies blood samples were obtained at timed intervals from an intravenous cannula in a superficial forearm vein, collected in heparinized tubes containing aprotinin, held on ice, processed at 4°C, and stored at -70°C. In paired double-blind 5-day studies with 0.63 μg/kg subcutaneous GLP-1 or vehicle volunteers injected a coded dose of GLP-1 or vehicle before each meal over five consecutive days. Volunteers used their established insulin treatment programs, which included predetermined algorithms for adjustment of insulin dosage before meals. Vials of GLP-1 or vehicle were stored in home freezers and carried in an ice pack during each day of the study. We established that GLP-1 stored in a home freezer maintained its biological activity with respect to responses of glucose and pancreatic polypeptide. Volunteers recorded all insulin doses and capillary blood glucose values before meals, at 30 and 60 min after breakfast and supper, and at bedtime. Self-determined home blood glucose values on day five correlated with laboratory values for the same samples with R2 0.94. To ascertain any modification of the effects of GLP-1 following repeated subcutaneous administration, breakfast tests with 0.63 μg/kg GLP-1 were conducted on the day before and on the day after each five-day study. Volunteers gave signed informed consent to protocols approved by the University of Western Ontario Research Ethics Board for Health Sciences Research Involving Human Subjects. Synthetic human tGLP-1(7-36)amide (Bachem, Torrance, CA) was dissolved in 0.05% human serum albumin in saline, sterile-filtered, tested for sterility and pyrogens, and stored at -20°C. The concentration of GLP-1 was based on weight corrected for the peptide content given by the manufacturer. Plasma glucose concentrations were determined with a Beckman Glucose Analyzer II (Beckman, Palo Alto, CA). Plasma samples were assayed for pancreatic polypeptide with 125I-pancreatic polypeptide and antiserum 615/1054 B-248-19 (RE Chance, Lilly, Indianapolis, IN), for glucagon with 125I-glucagon and antibody 04A (RH Unger, Dallas, TX), and for C-peptide with 125I-C-peptide and antibody 7309 (Peninsula Laboratories Inc, Belmont CA). Free immunoreactive insulin was measured with 125I-insulin and antibody from P. Wright, Cambridge, UK, in serum extracted with polyethylene glycol . Intraassay variability was less than 8% for all radioimmunoassays. Interassay variabilities of 9% for pancreatic polypeptide, 16% for glucagon, 12% for C-peptide, and 24% for free immunoreactive insulin, were corrected with standard values for control samples run in each assay. Plasma lactate levels were determined with a YSI analyzer (Yellow Springs Instrument Co, Yellow Springs OH). Data are presented as mean values ± SE. Incremental (delta) areas under curves were calculated geometrically for stated time periods and time-averaged by dividing by the total elapsed times. Statistical significance of differences between mean values was determined by two factor ANOVA and two-tailed paired t-tests. A P value of less than 0.05 was considered statistically significant. 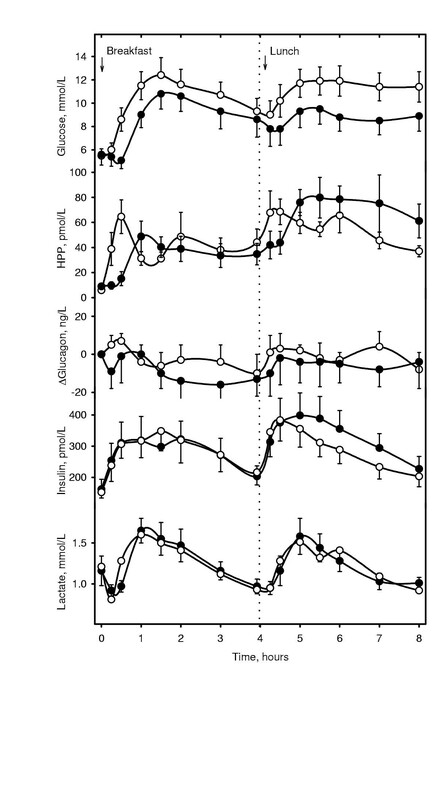 Incremental (delta) excursions of plasma glucose through 3 hours, pancreatic polypeptide responses through 30 min, and glucagon responses through 60 min after meals were reduced in a dose-dependent manner by GLP-1, Figure 1 and Table 2. The dose of 0.63 μg/kg GLP-1 was selected for further studies because it was sufficient to delay gastric emptying through 30 min but did not cause the abdominal discomfort or nausea occasionally associated with higher doses. Dose-effect of glucagon-like peptide 1. 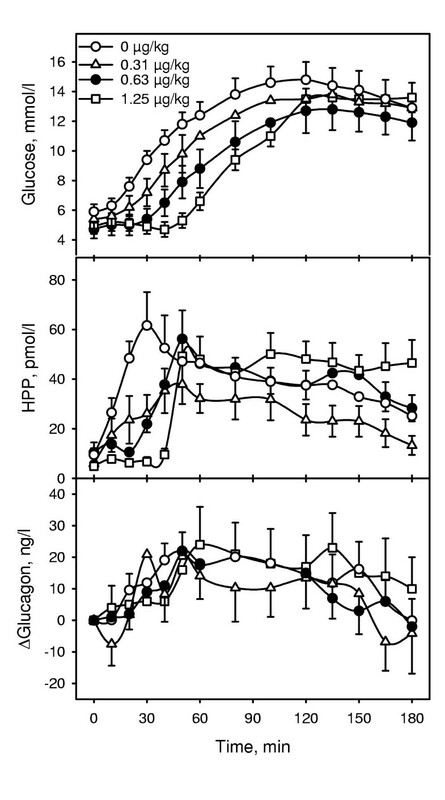 Plasma glucose, pancreatic polypeptide(HPP), and incremental glucagon responses to breakfast with subcutaneous injection of varying doses of GLP-1 with usual insulin in volunteers with type 1 diabetes. Dose effect of glucagon-like peptide 1. Effects of graded doses of GLP-1 and usual insulin before breakfast in volunteers with type 1 diabetes with no endogenous insulin secretion, with number of subjects studied at each dose. Time-averaged incremental (delta) responses (area under the curve divided by total time) of plasma glucose through 3 hours, pancreatic polypeptide(HPP), 0 to 30 min, and glucagon, 0 to 60 min, mean ± se. Polynomial regression analysis (R2) for dose vs incremental responses. In 8-hour studies in-hospital, plasma glucose, pancreatic polypeptide, and glucagon responses to meals were depressed by GLP-1 compared with vehicle, Figure 2, Table 3. Plasma glucose values differed for GLP1 and vehicle in a time-dependent manner through eight hours as shown by two-factor ANOVA with replication, P < .0001. The mean values for time-averaged incremental areas under the curves for free immunoreactive insulin did not differ over eight hours for studies with GLP-1(158 ± 39 pmol/l) and vehicle(136 ± 31). There were also no detectable differences between levels of plasma lactate on the two occasions. No adverse effects or episodes of hypoglycaemia were noted. There were no systematic changes in the insulin treatment algorithms, or in the doses of insulin given according to these algorithms. Eight-hour studies with glucagon-like peptide 1. Plasma glucose, pancreatic polypeptide(HPP), incremental glucagon, free immunoreactive insulin, and lactate responses to breakfast and lunch with subcutaneous injection of 0.63 μg/kg GLP-1 (closed circles) or vehicle (open circles) immediately before meals in volunteers with type 1 diabetes, n = 9. Eight-hour studies with glucagon-like peptide 1. Effects of vehicle or 0.63 μg/kg subcutaneous GLP-1 and usual insulin at breakfast and lunch in paired studies in 9 volunteers with type 1 diabetes with no endogenous insulin secretion. Time-averaged incremental values (area under the curve divided by time) for plasma glucose through eight hours and for plasma pancreatic polypeptide from 0 to 30 min for both meals (HPP), and mean values for incremental plasma glucagon through 60 min for both meals, mean ± SE. Time-averaged incremental areas under the curves for capillary blood glucose levels from breakfast to lunch and from supper to bedtime were lower during five days with GLP-1 than five days with vehicle (-0.64 ± 0.33 vs 0.34 ± 0.26 mmol/l, P < .05), Figure 3. Fasting capillary blood glucose levels did not differ for five days with GLP-1 compared with five days with vehicle (8.0 ± 0.64 vs 7.7 ± 0.64 mmol/l). No episodes of assisted hypoglycaemia occurred nor were there any changes in insulin dosage (0.77 ± 0.07 vs 0.74 ± 0.06 U/kg/day). Injection of GLP-1 elicited no symptoms during the at-home study, and volunteers reported normal appetite and food intake. Five-day studies with glucagon-like peptide 1. 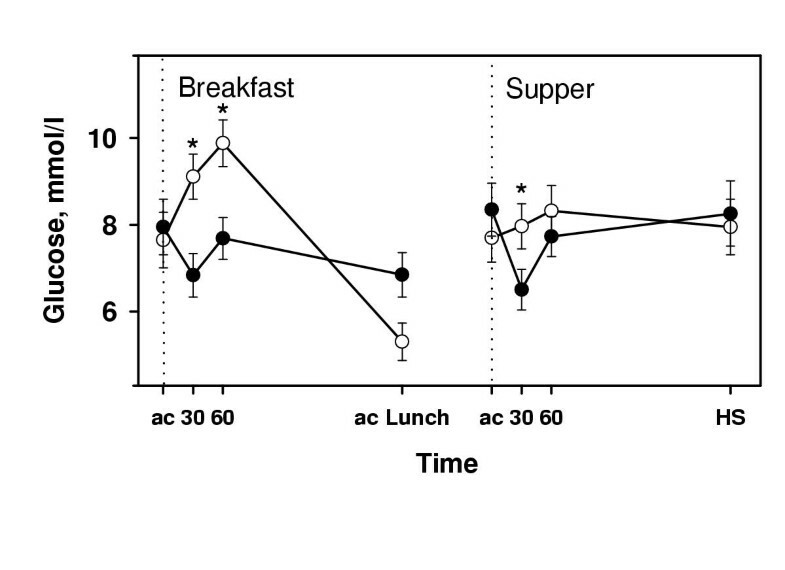 Capillary blood glucose values, mean ± SE, before meals (ac), at 30 and 60 min after breakfast and supper, and at night (HS), over five days with self-administered subcutaneous GLP-1 and usual insulin before meals (closed circles) and over five days with vehicle before meals (open circles) in volunteers with type 1 diabetes, n = 8. *P <.05 for time points, paired t-tests. The standardized breakfast tests on the day before and on the day after the 5-day trials showed no modification of the effect of GLP-1 on plasma glucose and pancreatic polypeptide responses, Table 4. Mean time-averaged incremental areas under the curves for free immunoreactive insulin through three hours did not differ in the tests before and after the 5-day studies(178 ± 49 and 139 ± 29 pmol/l before and after 5-day studies with GLP-1, P = 0.19; 135 ± 40 and 167 ± 46 before and after 5-day studies with vehicle, P = 0.42). Effects of glucagon-like peptide 1 before and after 5-day studies. Effects of vehicle at breakfast and effects of 0.63 μg/kg GLP-1 at breakfast on the day before and on the day after 5-day studies with GLP-1 or with vehicle in paired studies in eight volunteers with type 1 diabetes with no endogenous insulin secretion. Time-averaged incremental values (area under the curve divided by time) (AUC) for plasma glucose through three hours and for plasma pancreatic polypeptide from 0 to 30 min (HPP), mean ± SE, were higher for tests with vehicle at breakfast than for tests with GLP-1 at breakfast, ANOVA, repeated measures, P <.05. Mean AUC values for glucose and HPP did not differ for tests with GLP-1 at breakfast. We have demonstrated the efficacy and apparent safety of subcutaneous injection of GLP-1 together with insulin for reduction of glucose excursions after meals in type 1 diabetes, in volunteers with no detectable response of plasma C-peptide to the meals. We have also demonstrated that subcutaneous GLP-1, self-administered before meals, improved glycemic control in type 1 diabetes through five days with no modification of effects. All volunteers were receiving intensified insulin therapy using multiple daily injections or continuous subcutaneous insulin infusion, according to current guidelines, with good metabolic control demonstrated by their mean fasting plasma glucose, fasting capillary blood glucose, and haemoglobin A1c levels. Other studies in humans with type 1 diabetes suggest that GLP-1 may have metabolic effects that develop during prolonged parenteral delivery of the peptide [1, 4, 9]. The possibility that such effects can develop after a brief exposure to GLP1 with continuing hyperglycaemia, as in the present study, cannot be excluded. Given the absence of endogenous secretion of insulin and lack of evidence of an effect of GLP-1 on the clearance of exogenous insulin, we infer that the glycemic effect of the peptide was not mediated by increased exposure to insulin. However, delay of delivery of a meal relative to administration of insulin by 15 minutes or more may itself be sufficient to account for prolonged enhancement of the glycemic effect of insulin . We suggest that delay of gastric emptying by GLP-1, with time course indicated by postponement of the pancreatic polypeptide response for approximately 30 min from initiation of meals, was the major factor in determination of the glucose effect of the peptide. It has been shown that GLP-1 can inhibit glucagon secretion in normal humans, and in volunteers with type 1 or type 2 diabetes, and this action may contribute to reduction of glucose responses to meals . In our results and other studies of type 1 diabetes under good metabolic control with intensive insulin therapy , an abnormal rise of plasma glucagon did not occur after meals. However in the present study GLP-1 suppressed plasma glucagon levels below those observed after meals with injection of the vehicle. Thus it is possible that inhibition of glucagon secretion contributed to the reduction of glucose excursions in the present study. The 5-day studies of self-administration of GLP-1 had limitations dictated by practical considerations. Self-determination of blood glucose levels was confined to testing before meals and at 30 and 60 min after breakfast and supper, but was not undertaken across lunchtime because this was considered impractical by some of the volunteers. Nevertheless reduction of reported values for capillary blood glucose levels after meals in these studies is consistent with the reduction in plasma glucose values observed in 8-hour studies in-hospital. Thus self-administration of GLP-1 over five days was effective in improving glycemic control. The 5-day study was not long enough to modulate long-term indices of glycemic control such as glycated hemoglobin. However the results suggest that long-term use of GLP-1 may result in clinically significant reductions in A1c levels in patients in whom further intensification of insulin therapy is limited by the risk of hypoglycaemia. The volunteers in the present studies were already on established intensive insulin regimens and were well-controlled as shown by the low values for fasting glucose and hemoglobin A1c. Many people with type 1 diabetes mellitus receiving apparently optimized insulin treatment fail to achieve acceptable levels of hemoglobin A1c, and in such patients further improvement of glycemic control might also be attainable with GLP-1. In the present study it is notable that the effect on glycemic control was not associated with systematic change in insulin dosage or with an increase in symptomatic hypoglycaemia. The insulin treatment programs of the volunteers were not modified in order to avoid confounding effects of such changes on interpretation of the findings. However further studies with GLP-1 agents should also assess the possible benefits of concurrent optimization of the insulin treatment program and the dosage of GLP-1. GLP-1 is known to be degraded rapidly in the circulation and has a short duration of action. Inhibitors of degradative dipeptidases have been used to prolong the duration of action of GLP-1  but these agents may have adverse effects due to non-specific activity. Analogues of GLP-1 with longer duration of action [12, 13] have been reported to have antidiabetic effects and may be more effective than GLP-1 in well-controlled type 1 diabetes. We suggest that GLP-1 agonists as potential congeners with insulin in treatment of diabetes may improve glycemic control beyond the level safely achieved with insulin therapy. This possibility should be explored in studies of sufficient duration to assess indices of long-term glycemic control. GLP-1 administered by subcutaneous injection before meals improves glucose control in type 1 diabetes through five days with no modification of effects. The necessary dose, and the safety and efficacy of GLP-1 in patients with no endogenous insulin secretion and with well-controlled type 1 diabetes have been demonstrated in the present study. GLP-1 agonists may be useful in enhancement of glucose control in type 1 diabetes during optimized treatment with insulin. We are grateful for technical assistance from M. Paul Williamson and Christine Moogk, preparation of GLP-1 solutions by Pamela Zabel, and nursing assistance from Janice McCallum. Parts of this work were presented in abstract form at the 59th Annual Meeting of the American Diabetes Association, Diabetes 1999, 48: Suppl 1 A442, and at the 60th Annual Meeting of the American Diabetes Association, Diabetes 2000, 49: Suppl 1 A103. JD received operating support for these studies from Amylin Pharmaceuticals Inc., through an agreement of collaboration with London Health Sciences Research Inc. JD holds a patent entitled "Treatment of Diabetes", assignee London Health Sciences Centre, with issued patents in Europe, EP 0762890B1, and Australia AU 0711611B2, and with pending applications in the US, 08/737,446, and Canada, 2,190,112. MB participated in designing the studies, coordinated experiments and assays, performed the statistical analyses, and drafted the manuscript. JD conceived of the studies and participated in revising the manuscript. TM participated in revising the manuscript.